Learn to incorporate new grains into your baking with this Whole Grain Baking Class with Jess Ross of Gold Island Bakery. This delightful class is perfect for both beginner and experienced bakers. Jess Ross of Gold Island Bakery will show the class how to add locally grown, highly nutritious and delicious flours to your baking. Jess will give lots of information on sourcing local grains for home baking. You will make a spelt dough and use it to create some delicious baking. Take some home, if you don’t eat it all in the class! 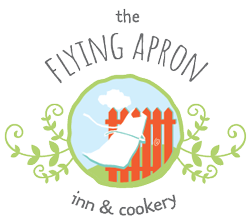 *Note: A full meal is not included, however a hearty Flying Apron soup and will be served with delicious bread & cheese! This specialty class has both hands-on and demonstration components. You will take home recipes and instructions for whole grain baking. Our beautiful Cookery School kitchen is licensed so you may order local beer and wine from our drink list to enjoy during your class.